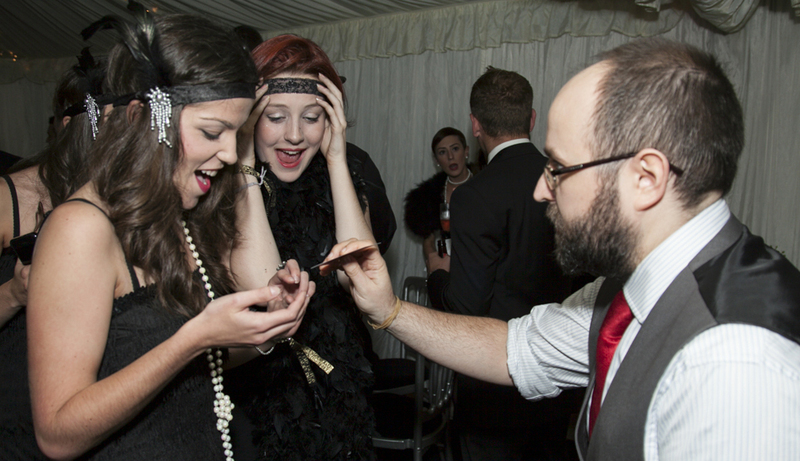 Whether it is an intimate wedding or a party of 20 Neil will entertain and engage with his own unique style of magic. Neil currently has one of the highest Google Reviews for magicians in the Kent area. Neil will Entertain, Amaze Friends, Family and Colleagues. As a professional Magician based in Chislehurst, Kent. I am lucky enough to share my passion of magic and mind-reading across the United Kingdom. I entertain a myriad of events from private Parties, Weddings and glamorous Awards dinners. Unsure of what to expect from a Magician? You can see Neil perform live. You can be assured that when you hire me for your event you are getting polite, experienced, skilled performer who will enthrall your guests, break the ice and ensure your party's success. Your Wedding Day is going to be an amazing whirlwind with you in huge demand. Have a look at weddings Neil has previously performed at. You can rest assured that while you are enjoying your Wedding your guests are being looked after and having fun with an experienced Wedding entertainer. From the moment I arrive at your Wedding, I will make sure that everyone is not only looked after but gets to experience the fun and astonishment that my magic provides. You will hear gasps of disbelief, cheers, shared laughter and applause as my interactive magic creates an electric atmosphere. Neil is also the recommended supplier for Robert Denholm House. How Can Neil Enhance Your Special Day? When a company is organizing any kind of event it is vital that any entertainment or entertainer they hire will not only supply an act that will impress but also embody the behavior's and professionalism demanded from the business world. I ensure that you get both uniquely astounding Magic, but also a superb customer service and a professional attitude that you can rely on. Can Neil provide entertainment that promotes your brand? You've hired a great space or prepared your house for your party. The place is decorated, the drinks are ready, the food is prepped and the guests have started to arrive. Imagine having a professional Magician mingling amongst your friends and family creating bursts of spontaneous applause, shared laughter and delighted gasps of surprise and disbelief. Thinking of hiring a Magician for a function? Sign up to get the latest content first.